Introductory pricing applies to 2019 plots. Reserve your plot today. Please download your digital tree selection booklet here to decide which memorial option is best for you. Secure your memorial plot today and create a peaceful resting place for you and your family in the Wellington Legacy Sanctuary. You will Join your community in creating a magnificent memorial forest which is also vital habitat for the native Quokka and Black Cockatoo. Some of the giants at Wellington Sanctuary (Jarrah and Marri) are over 30 metres tall. How do I choose my tree? When you reserve your place, you will be asked to select your memorial tree and personalised wording for your memorial plaque, but you can also choose to make those choices later at any stage prior to May 15. After registering, you will receive a confirmation email and regular follow up emails with useful information a detailed itinerary and general advice to ensure your planting day is a most beautiful experience. Choose up to 7 Significant Trees, 1 x personalised custom 1-metre tall steel plaque for every 1-5 infusions and the inclusion of up to 100 Plants in the surrounding plot area of your significant trees. 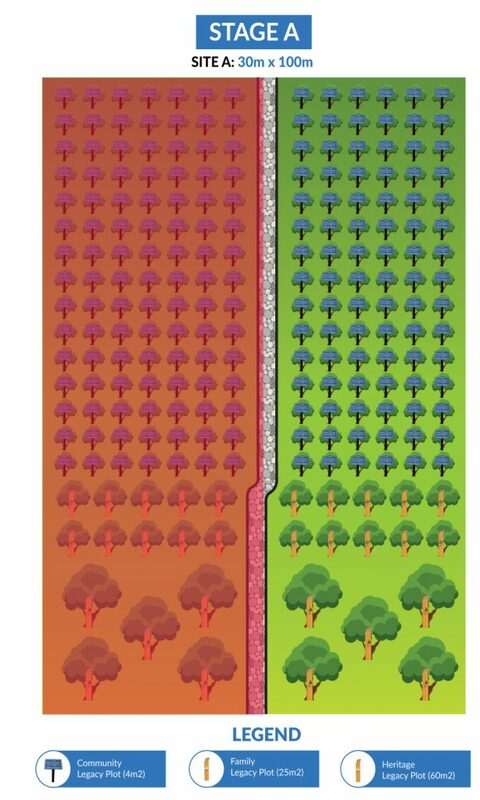 People who wish to have an exclusively large, established and beautiful dedicated forest area in memory of family and loved ones and wish to infuse more than 1 x ashes into a Living Legacy Tree and/or have additional ashes of loved ones infused into your legacy tree or other legacy trees within a generous ‘Heritage Legacy Plot’ zoned area . Access to your designated plot area to plant your legacy tree inside the ‘Family Legacy Plot’ area of the Wellington Sanctuary location. ‘Living Legacy Ash Treatment Formula’ to treat ashes respectfully with living molecules to help trees grow for every infusion. The assistance of our Living Legacy Forestry Experts on the Planting Day to aid in planting. “Personalised Large Corten Steel Plaque’s” to locate your family plot area in remembrance of your loved one with personalisation of loved one’s name on the plaque. Your legacy tree(s) will be a part of the largest, exclusive designated ‘Heritage Legacy Tree’ area. Your legacy tree(s) will be part of this ‘Legacy Heritage’ area that family and friends can visit to pay respects and enjoy the tranquillity of nature. Choose up to 3 Significant Trees, 1 x personalised custom 1-metre tall steel plaque and the inclusion of planting 30 Plants in the surrounding plot area of your significant trees. People who wish to infuse more than 1 x ashes into a Living Legacy Tree and/or have additional ashes of loved ones infused into your legacy tree or other legacy trees within your ‘Family Legacy Plot’ area. A dedicated 25m2 conservation plot where your ‘Living Legacy Trees(s). Access to your designated plot area to plant your legacy tree inside the premium ‘Family Legacy Plot’ area of the Wellington Sanctuary location on Planting Day. ‘Living Legacy Ash Treatment Formula’ to treat ashes respectfully with living molecules to help trees grow with every infusion. Assistance from our Living Legacy Forestry Experts on the Planting Day to aid in planting. A “Personalised Large Corten Steel Plaque” to locate your family plot area in remembrance of your loved one with personalisation of loved one’s name on the plaque. Your legacy tree will be a part of a larger designated ‘Family Legacy Tree’ area. Your legacy tree will be part of this ‘Family Legacy’ area that family and friends can visit to pay respects and enjoy the tranquillity of nature for the future. Choose 1 Significant Tree and a Personalised Plaque to commemorate your loved one. Individual Ashes of 1 x loved one who wishes to be infused into one tree on their own. No further ash infusions can be made into your chosen Community Legacy Tree. Access to your designated plot area to plant your legacy tree inside the ‘Community Legacy Tree’ area of the Wellington Sanctuary location on Planting Day. ‘Living Legacy Ash Treatment Formula’ to treat ashes respectfully with living molecules to help trees grow. Assistance of our Living Legacy Forestry Experts on the Planting Day to aid in planting. A “Personalised Plaque” to locate your individual plot area in remembrance of your loved one. Your legacy tree will be a part of a larger designated ‘Community Legacy Tree’ area. Your legacy tree will be part of this ‘Community Legacy’ area that family and friends can visit to pay respects and enjoy the tranquility of nature for the future. Individual Ashes of 1 x loved one who wishes to be infused into one tree on their own and to be planted at your home. The assistance of our Living Legacy Forestry Experts on the Planting Day to aid in the infusion of your loved ones ash into the potted sapling. Living Legacy Forest will plant 200 trees in your name as a final contribution forming part of your loved one’s legacy. Be part of this great community project with the gift of native flowers which you can dedicate to a friend or loved one, helping sponsor the conservation of this beautiful forest. Your flowers are a selfless gift that will beautify the memorial forest, connecting grieving families to the beauty that life and community creates. Anyone that wants to be part of this inspiring community project but has no current need for a memorial tree or for anyone wanting to dedicate a special and meaningful act for someone they love or may have lost. Sanctuary either in your own name or in dedication to someone else. membership has helped shape this amazing community project.